One of Bearing Service’s most reliable manufacturers, U.S. Tsubaki Power Transmission, LLC, recently announced the addition of a new product, Titan Series Chain, to its current Roller Chain line. 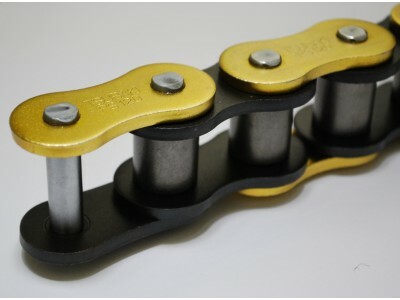 Utilizing all of the traditional elements of Tsubaki’s standard ANSI chain and including new features specially developed by the company’s research department, the Titan Series chains have been engineered to increase the lifespan of roller chains in high speed and harsh applications. By using a newly developed chain construction that includes coated pins, black oxide roller link plates, ring-coined connecting links and Tsubaki’s G7 Solid Bushings, the Titan Series roller chains have proven to be stronger, more reliable, and more durable than standard roller chains. As a result, end users can expect less frequent replacement costs, lower maintenance costs and less downtime due to broken or damaged roller chains. U.S. Tsubaki is known for their dedication to quality, dependability and customer service. Aiming to consistently innovate their line of power transmission products, the company is well-equipped to handle their clients’ needs, both now and in the future. With a global presence and the ability to draw upon a pool of expert engineers, U.S. Tsubaki’s dedication to continuous improvement has made them one of Bearing Service’s most dependable and valuable manufacturers. At Bearing Service, our mission is to form lasting relationships with our clients by providing them with innovative solutions and anticipating their needs. In U.S. Tsubaki, we have found a likeminded partner that is equally dedicated to meeting the needs of the present while keeping an eye on the needs of the future. If you’ve been looking for a supplier of bearings, clutches, engineered chain, sprockets or more, contact us today to learn more about how the team at Bearing Service can help.